and not being able to find information about what's happening can be even more frustrating. We do our best to make sure outages don't happen, but when they do, we think it's important to be transparent and communicate those issues. 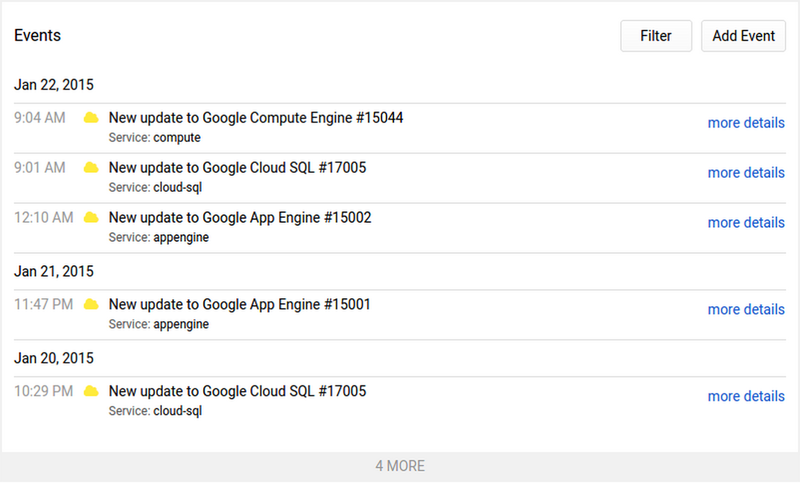 Starting today, you'll be able to receive status updates for Google Cloud Platform services on the Google Cloud Platform Status Dashboard. This augments the additional tools and services – including Google Cloud Monitoring – that monitor your service's health. We hope that these services will make disruptions a bit more bearable by surfacing the latest information and helping you quickly find workarounds. As disruptions in service occur (and we’re working very hard to ensure they don’t! ), they’re reported on the dashboard with a red bar, which persists until the disruption is resolved. 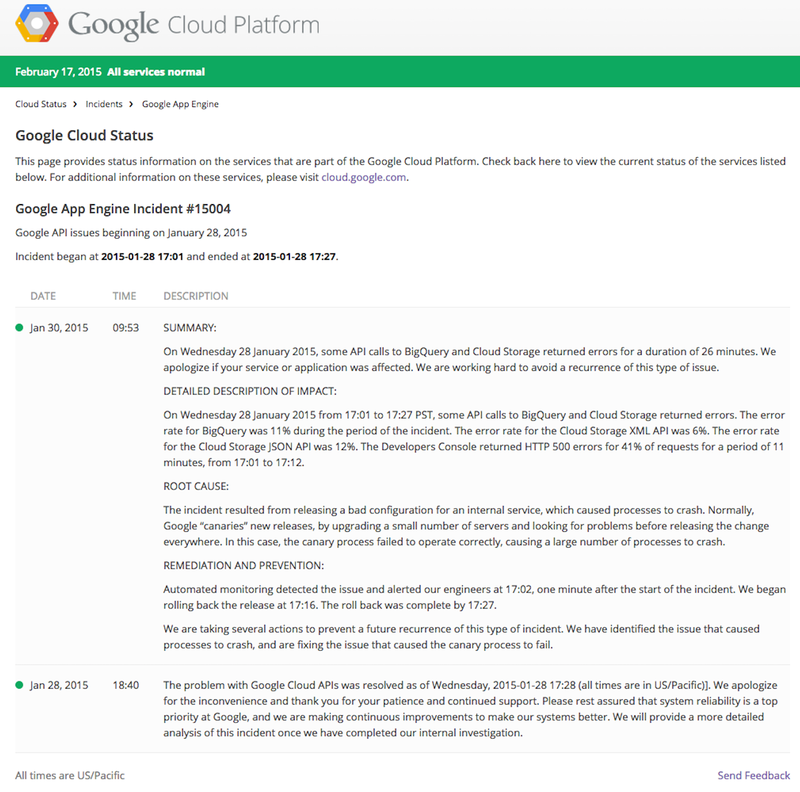 The example below shows an example of a Google App Engine service disruption that occurred last month on Jan 28th. 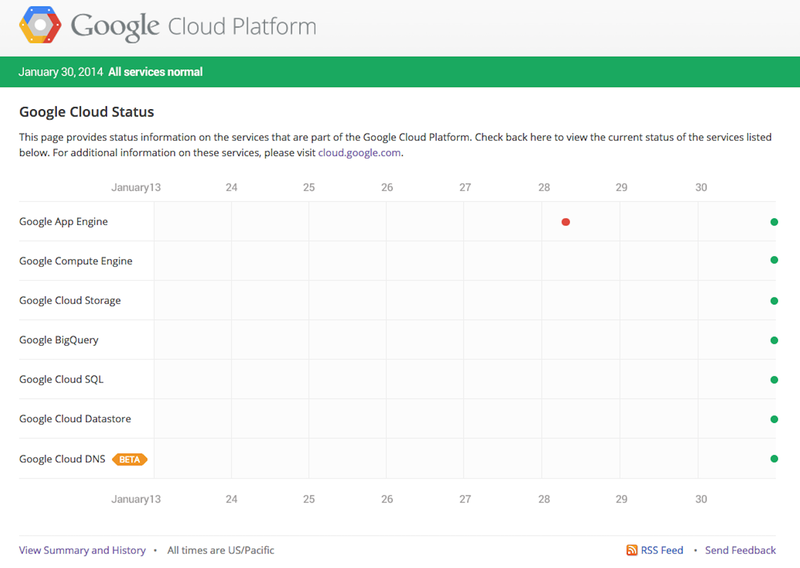 The current status of Cloud Platform services is shown by the column of indicators on the right side of the graph. In the example above, the indicators are all green which means that all services were operating at normal levels at the time the screenshot was taken. You can also check out the status history of each service – the dashboard will always show the last seven days, but just click on “View Summary and History” to see any of the incidents reported over the past 90 days. Click on any incident to get a more detailed explanation of what happened. The screenshot below details the above incident that began at 2015-01-28 17:01 and lasted 26 minutes. As you can see, the green indicators next to the dates and times mean the incident has since been resolved. Stay up to date by subscribing to the Status Dashboard RSS feed, available from the link at the bottom of the Status Dashboard page. We have also integrated reporting of Cloud Platform service incidents in your Cloud Monitoring events log, enabling you to view incidents alongside your other dashboards and monitoring data. While in beta, we’re reporting status for seven services, aggregated across all regions. The Status Dashboard does not deprecate any other means of communicating outages. We’d love to hear your feedback and suggestions. Please submit your feedback by clicking the link at the bottom right of the dashboard page. We know that even the smallest service disruptions can cause inconveniences on your end – and not being able to find information about what's happening can be even more frustrating. We do our best to make sure outages don't happen, but when they do, we think it's important to be transparent and communicate those issues.